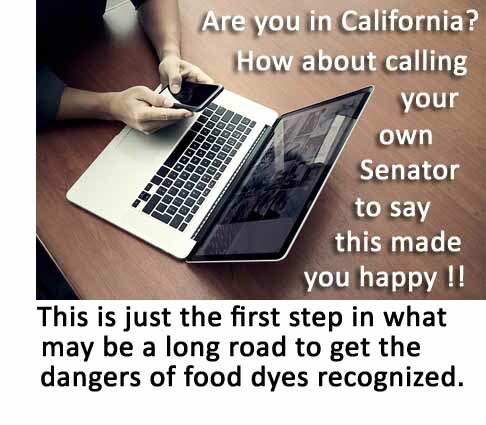 The Senate Health Committee today approved a bill by Senator Bob Wieckowski (D-Fremont) to direct a state agency to review scientific literature on the risk synthetic food dyes pose to some children and what steps, if any, the state should take to protect the public health. Longstanding health concerns about food dyes have led to warning labels on most dyed foods in Europe and many companies are removing dyes from their products. SB 504 directs the state’s Office of Environmental Health Hazard Assessment (OEHHA) by Dec. 1, 2018 to review existing published, peer-reviewed scientific literature on the risks to children and report to the Legislature by July 1, 2019. The OEHHA is the lead state agency for assessment of health risks posed by environmental contaminants. There’s a growing consensus among physicians and researchers that excluding food dyes reduces adverse behavior in some children. About 30 double blind studies have investigated the effects of synthetic dyes and other suspect additives. Companies such as Mars, Nestle, General Mills, Kellogg, Kraft Heinz, Frito-Lay, Dunkin’ Brands Group (owner of Dunkin’ Donuts and Baskin-Robbins) and others, are eliminating synthetic dyes from some or all of their products. CSPI estimates that almost 40,000 children in California are affected by food dyes. About 2,000 people contacted CSPI to describe how dyes affected their kids. Heather Knape told the committee that artificial colors can intensify the symptoms of ADHD in her son, who experienced problems after snacking on peanut M&Ms. It was days later when Knape learned about the link between synthetic food dyes and children with ADHD. But staying away from the products is not easy. Dr. Mark Horton, the former director of the California Department of Public Health, who supports the bill, agreed. The bill is also co-sponsored by the Children’s Advocacy Institute and is supported by many public health, consumer and environmental organizations. Senator Wieckowski represents the 10th District, which includes parts of Alameda and Santa Clara counties. This entry was posted in 2016-2020, Articles, Food Dyes. Bookmark the permalink. Right you are. Giving food treats instead of stars or other nonfood rewards is not right on many levels. Nevertheless, I always provided the teachers with natural treats they were allowed to give my kids. The easiest is simply sugar cubes (doesn’t stay on the teeth as long as sucking candy and my kids liked them). But make sure you have your child’s name clearly on the product (I do recall once that the ice cream bars I had put in the teacher’s lounge freezer for my child got eaten by other teachers). I also would volunteer to be room mother and provide holiday cakes etc. That way my kids could eat the same stuff as everybody else and it was all natural. Parents have a choice on how or what they choose to feed their children. However when teachers decide to reward children in the classroom, that undermines the parent. This common practice should not be freely allowed. Teacher’s should not have the right to feed children,’especially when it’s harmful to them. When is this simple change going to be enforced in the schools?